I seem to be missing a fundamental detail about curve networks. If I select a group of curves (either made manually or through a "Apply Random Voronoi Pattern to planar PolySurface" command from a RHino plug in) I get an error in the sdrCNF box saying "Object reference not set to an instance of an object." Does anybody know what this means and what I need to do to resolve? Thanks. Thanks for posting your comment. Unless you are using the older (GH v0.6.0059) you should have seen a warning dialog saying geometry gym components require a license to operate. Instructions for including a licenes are outlined here: http://www.grasshopper3d.com/group/geometrygym/forum/topics/installing-geometry-gym , simply run the rhino command sdrZZLicenseReqeust and follow the prompts. I tried with GHv0.8.0006 and it is not working and I also tried with your way but it's still not working. Do you have any idea? Hi, how can obtain a 2d pattern of the water cube from the waerie & phelan structure?...please help me! the second pattern is broken, can help me? i am new in grasshopper,I made some experiments. but is there a easy solution to extrude a rectangle profile along the curves? 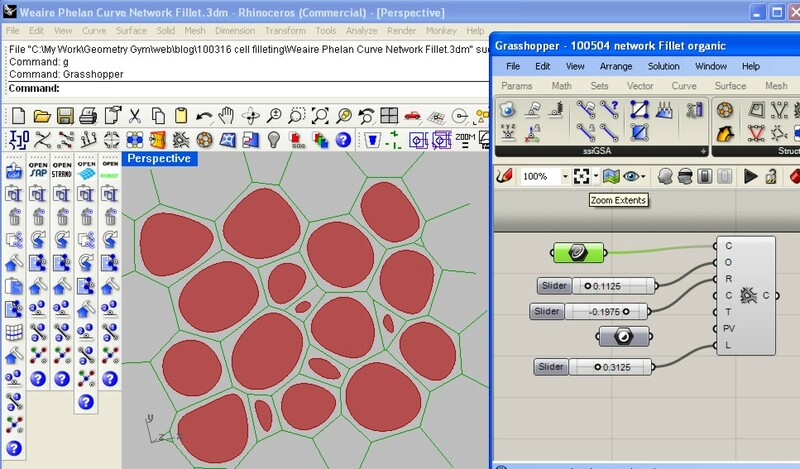 Yes I provide tools to extrude or sweep profiles (library and user defined) along curves from Rhino or Grasshopper, I'd start with a recent post (http://geometrygym.blogspot.com/2011/06/rhino-v5-extrusions-geomgym-plugins.html ) and an old post (http://geometrygym.blogspot.com/2009/10/extruding-along-rhino-curves.html ) and I'm happy to point you to other relvant posts. could someone post the file in dwg, pln, pdf, dxf, i am keen to see what the geometry is of the building in plan view. i want to pack eqaully sized spheres within a volume for example a cylinder. i made a hexagonal grid and placed spheres at their vertices and copied layers in the z axis. i want to set consraints for this gris system by using a volume.